Mr. Rajiv Kaul, CMD, Nicco Corporation presenting the Medal to Mr. Shiv Nadar, Founder & Chairman, HCL at the 57th annual convocation. Fr. E Abraham, Director, XLRI looks on. 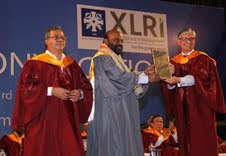 The momentous occasion of Convocation is celebrated at XLRI with great zeal. Students donned their hats and gowns and received their diplomas at the 57th Annual Convocation in presence of the pioneer as well as doyen of the Indian IT industry, Mr. Shiv Nadar, Founder & Chairman, HCL and Shiv Nadar Foundation. After two years of strenuous schedules and academic rigor the batch of 2013, comprising 236 students of Post Graduate Programmes in Management, 6 students of Fellow Program in Management from Jamshedpur Campus and 25 students from Ex-PGP course from Dubai Campus, received their graduating certificates and medals displaying a sense of pride and sorrow. Pride was apparent as they joined the elite club of XLRI alumni and sorrow was not far behind as they realized that tomorrow they leave an exciting and fun-filled learning environment to enter into the harsh realities of working life in the demanding corporate world. At the ceremony, in continuation of almost forty-five years tradition XLRI conferred the prestigious ‘Sir Jehangir Ghandy Medal for Social and Industrial Peace’ on Mr. Shiv Nadar for his contribution towards the shaping of Indian IT Industry. Mr. Rajiv Kaul, Member of Board of Governors, XLRI and Chairman and Managing Director Nicco Corporation, presented the prestigious medal to Mr. Nadar. Expressing his gratitude to XLRI, Mr. Shiv Nadar said, “I feel privileged to be recipient of ‘Sir Jehangir Ghandy Medal for Social and Industrial Peace’ and to join its illustrious club of past recpients”. Congratulating the students, he said “I am delighted to hear that the entire batch has been placed. It also means that they are all placing a confidence and bets on you. The future of this nation cannot be created without the best leaders, managers and the topped. We have great hopes from each and every one of you”. “Leadership is a state of mind. A leader has a vision. He may not know exactly how to reach those; but he get to find his way to reach his goals” he added. On this significant occasion, reading out the annual report of the institute Fr. E Abraham S.J., Director of XLRI focused on the achievements and milestones of the leading institute during the academic session 2012- 13. “Today is an important day in the life of every student, faculty, and staff. It is the high-point of all the efforts put in by an individual during their time at the campus. This academic year has once again brought laurels to XLRI in different spheres that have done us proud. XLRI has made its presence felt particularly at the international level. Two international programmes have been launched. Our collaborators have displayed a keen interest in both the programmes” he said. “We are honored to have Mr. Shiv Nadar among us to receive the Sir Jehangir Ghandy Medal for Industrial and Social Peace. Shiv Nadar: IT pioneer, global Citizen, and a great visionary who has helped in building a sustainable humane world; at a time when India had a total of 250 computers, he is a true visionary, led a young team of eight which passionately believed in and bet on the growth of the IT industry. From designing India’s first PC at the same time as global IT peers in 1978; to working on the Boeing Dreamliner's airborne systems today, HCL has stayed a true Pioneer of Modern Computing” he added. Mr. Pratip Chaudhuri, Chairman, State Bank of India delivered the convocation speech to the graduating students. He congratulated and inspired the students with his words and shared some of his experiences on common challenges which they can face in their future lives as employees. Congratulating the students, Mr. Rajiv Kaul, Chairman and Managing Director Nicco Corporation said, “The alumni of XLRI have reached high levels of excellence in both the corporate world as well as the academia. Today, you too are joining that privileged group. Your future is in your hands. I am sure you will do exceedingly well”. At the ceremony, XLRI also felicitated Mr. Rakesh Kapoor, CEO, Reckitt Benckiser with the ‘Distinguished Alumnus Award’. Reckitt Benckiser is a British multinational consumer goods company which boasts international brands such as Dettol (the world's largest-selling antiseptic), Strepsils (the world's largest-selling sore throat medicine), Veet (the world's largest-selling depilatory brand), Air Wick (the world's second-largest-selling air freshener), Calgon, Clearasil, Cillit Bang, Durex, Lysol, and Vanish. Mr. Kapoor also congratulated the students and faculty on the occasion of convocation and shared words of inspiration with the students. At the event, the graduating batch of XLRI announced to donate an amount of Rs. 1,77,000 to provide educational support to tribal girls of Jharkhand.